Maybe wine isn’t allowed at the show, maybe Gordon’s gin took carte blanche on the alcohol license. Maybe wine brands, wine producers, wine importers, wine retailers (delete as appropriate) don’t have the marketing budget to take a stand (likely). Either way it was a great wine opportunity that was well and truly missed. It made me feel that the bridge between the wine drinking public and the wine trade is getting ever longer as a networking event in the drinks trade just a week later told quite a different story. During the same days that drinks giant Diageo boasted that their women employees can expect to earn around 9.2% more than their male colleagues we also celebrated female industry mavericks and creative entrepreneurs at the latest Women in Wine event. It was here that Corinna Pyke of Borough Wines summed it all up for me ‘There has never been a better time for women to work in wine.’ And she couldn’t be more right. 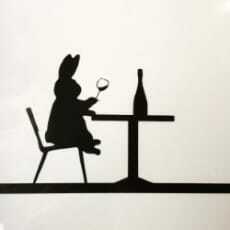 In the absence of any wine recommendations this week I bring you a wine drinking bunny bu HAM. HAM is a homeware collection by designer Jo Ham that captures the everyday adventures of the contented life of Rabbit and who now resides contentedly on my office wall.